OXFORD, Miss. – Alexander Bernstein’s connection to the legacy of his iconic father, Leonard Bernstein, probably began with a conversation they had in the family tree house when the younger Bernstein was 9 years old. 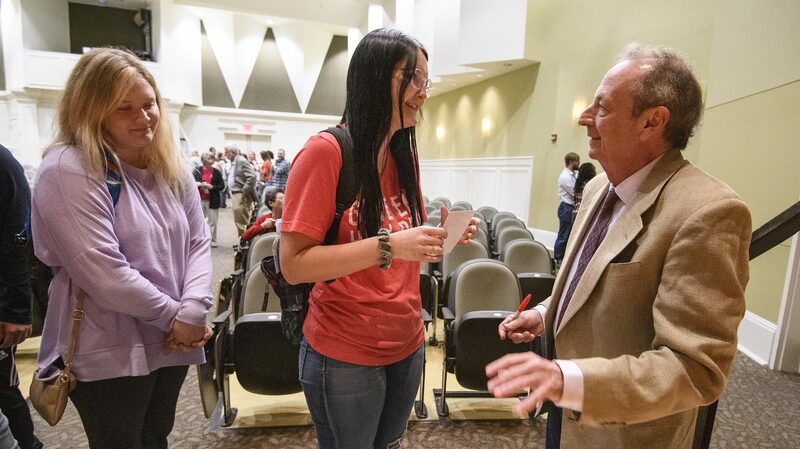 The son of the world-renowned composer, conductor, pianist, educator and activist visited the University of Mississippi on Tuesday (Nov. 6) as part of a global, two-year series of events celebrating what would have been the patriarch’s centennial birthday. During his time on the Ole Miss campus, Bernstein gave interviews and a lecture and attended a commemorative concert of his father’s music presented by guest conductor Dennis Shrock, several soloists, the Bernstein Festival Orchestra and the UM Chorus, directed by Donald Trott. Bernstein and his siblings all grew up seeing and hearing their father make connections between the arts and other academic disciplines. Leonard Bernstein’s practices – which later officially became known as ‘artful learning,’ an interdisciplinary educational model that uses fine arts to strengthen learning in all academic areas – in the family home were inconsistent with traditional educational models used in the preparatory schools the Bernstein children attended. Years passed before Leonard Bernstein’s passionate thirst for knowledge and desire to share it with others was fully embraced by his son. “I’d tried and failed at becoming an actor,” Alexander Bernstein said. “While earning my master’s degree at Harvard, I had an opportunity to substitute teach in one of the local schools. Through that experience, I became passionate about teaching. When Leonard Bernstein received a grant to establish his foundation, the son helped launch the first Artful Learning model in the Nashville school system in the late 1980s. Reception to the new educational approach was initially far from enthusiastic. Over time, schools using the model began to spread across the country, changing the landscape of teaching and learning. With his son serving as president of Artful Learning, Leonard Bernstein’s vision to use music and the other visual and performing arts as a means of instilling a lifelong love of learning in students is being fulfilled. The model begins with all teachers looking at the subject content that they are required by the state to teach. Together, they choose a concept and a significant question. The teachers then choose a masterwork to model their learning journey. The results are exciting, he said. Trott, who met Alexander Bernstein in 1992, just two years after his famous father died, said the visit was the highlight of the university’s celebration of Leonard Bernstein’s 100th birthday. Bernstein said he firmly believes that Artful Learning schools produce better human beings. 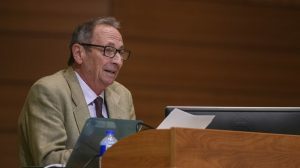 “By making connections between the arts and real life with other students, teachers, parents and the community, such collaborations yield academic improvement and critical thinking, and growth in compassion, understanding and civility,” Bernstein said. For more information about Artful Learning, visit https://leonardbernstein.com/artful-learning.